Some beauty shots for my photo fans. All photos were taken this past Saturday, August 26 in Marie's garden in Saratoga in upstate New York. The link on this post will take you to the flickr photo set of these pictures. The following four images of insects are all cropped down from the original full frame to zoom in on the detail. 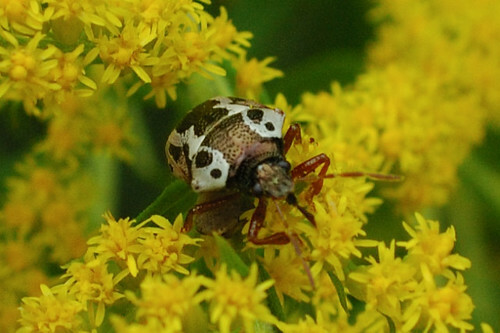 I browsed and searched the photos on Bug Guide to identify the beetles. 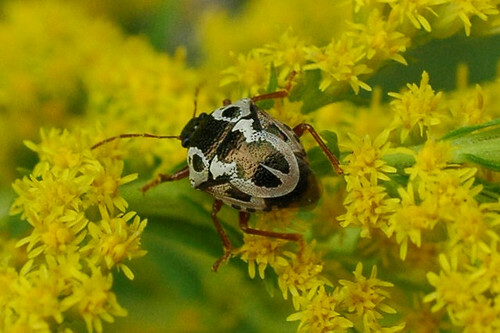 Stiretrus anchorago, Anchor Stink Bug, on Goldenrod, front and rear views. This guy was moving rapidly over the stalks, dipping his proboscis into each individual flower. I presume he/she/it was feeding on nectar from the flowers. 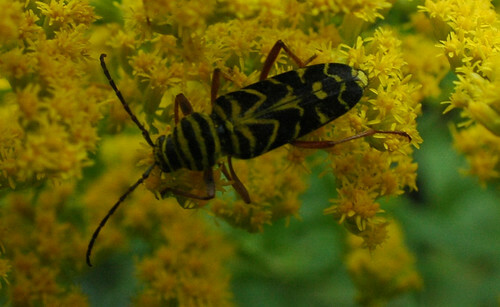 Megacyllene robiniae, Locust Borer, on Goldenrod. I apologize for this one being out of focus. This guy was also moving very quickly around on the goldenrod. This was the best shot I got. Death in the garden. Taking a cue from Bev's Phymata post, this stationary fly caught my eye. Not to mention that none of his/her/its feet were actually resting on the plant. This was a difficult depth-of-field situation. Again, I took several different shots with the focus on different plane in the image. This one gave me the best results overall, though parts are still clearly out of focus. The rest of these images are presented full frame and unedited. 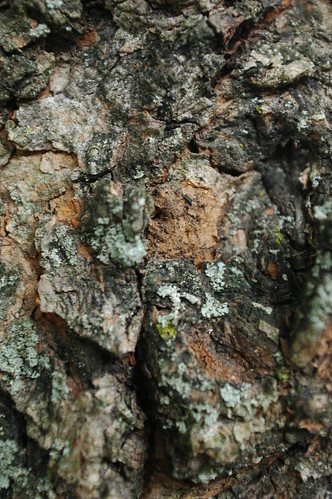 Silver maple bark with lichens. Black walnut leaflets. Only these leaflets at the end of the leaf had turned red. The rest of the tree was still green. Most recent analysis of the Southern Hemisphere total ozone from the an instrument on board the NOAA polar orbiting satellite. In austral spring the analysis shows the "ozone hole" (values below 220 Dobson Units) over Antarctica and the Antarctic Ocean. Theories about the cause included solar activity that affected the magnetic field, atmospheric motions and chemical reactions involving chlorofluorocarbons (CFCs), which had been used since the 1930s as refrigerants and propellants, such as aerosol sprays. ... The work conducted by the Antarctic team in the 1986 field study was the first to show that a chemical reaction triggered by the CFCs was indeed the cause. Scientific papers have been published recently showing early signs of a leveling off of ozone loss, linked to the success of international agreements to control CFC emissions worldwide. ... let's see how they [tips on improving vacation pictures] translate to our world. The first advice is to not cut off people's feet, which makes me wonder: is there a plant part that, if cut off, spoils the photo? And the admonition to avoid telephone poles coming out of your subject applies equally well to plant subjects as to human. But really, there's lots more useful stuff here, like the fact that we usually see the subject, not the whole frame, and we should always "check the borders." And my favorite - a discussion of qualities of light that goes beyond the avoid-harsh-sun advice we see everywhere to describe "sweet light" and suggest that flash be only during the day, never at night. I just love that counterintuitive stuff!! Specific to travel, photographers are reminded to catch these elements: people, scenics, details, food, movement, action, and nightlife. So what do you suppose the must-shoot elements would be in gardening photography? Maybe entrances, whole borders, close-ups, small plant combinations, animals, and such hardscape as seating, stone, wood, and statuary. What else? I started leaving a comment there, but after my comment started getting longer than her blog entry, I thought I should write my own in response! I've been "a photographer" since before the age of five, almost more decades than you can count on the fingers of one hand. The way I've photographed, and how I share my photography, has changed a lot over my lifetime. It continues to evolve, not only in response to the huge technological changes, but also to changes in me and my life and interests. I don't remember the last time I used a "real" (film) camera. The time lag for feedback between what I thought I shot and what I got made me try to make every shot count. Without access to a darkroom, or the skills to take advantage of it, I learned to compose my shots "in camera": to carefully frame each shot in the viewfinder to get exactly the picture I wanted to eventually see. Starting about 1980, I shot slide film exclusively. I "edited" each roll I got back, going through every slide, and selecting the ones which were not only technically perfect (focus, exposure, and so on) but which also captured what I was striving for when I took the picture. At most, I would get two or three "good" shots out of the roll; maybe 1-5% of all the photos I took. These are the only ones which anyone else would ever see. From this population I selected maybe 10% as "candidates" for printing. Again, maybe only 10% of these ever made it to paper. So most folks only saw a tiny percentage, less than 1/1000, of all the shots I took. And yes, I shot thousands of images each year. But I've kept my old habits. I still compose in camera, and take the time to setup each shot, even though I could easily crop the image on my computer. I don't dump every photo I take into public view; I still edit the collections. I still go through each image, deleting the ones which are out of focus, or shaky, or under- or over-exposed. Some of these could be corrected digitally, but, unless I have only one image of something, it's not worth it. There are other, better, shots in which I got what I wanted. And some things are unchanged by the technology. The qualities of light, dimensions of composition, and the sensuality of beauty and nature are, in deep ways, eternal. It's my challenge to capture those eternal qualities in a frozen image. I've got two basic reasons for my garden photography: beauty and documentation. While they're not mutually exclusive, my goal for any shot is primarily one or the other. Good examples of both, and examples of all of the following considerations, can be found in my recent series of photos of "Baby" at the Brooklyn Botanic Garden, as well as the other photographs in this blog. This doesn't mean that the top and bottom, or left and right sides, are mirror images of each other. Balanced asymmetry is much more interesting. Think of a larger and smaller person on a seesaw, and how they move along the beam to balance each others weights. A classic photographic example is the horizon line; it looks best above or below the center-line of the image, depending on where the interest lies. In garden photography, to achieve this I either let the primary subject fall to one side or the other, or let the line of the subject follow a diagonal across the frame. 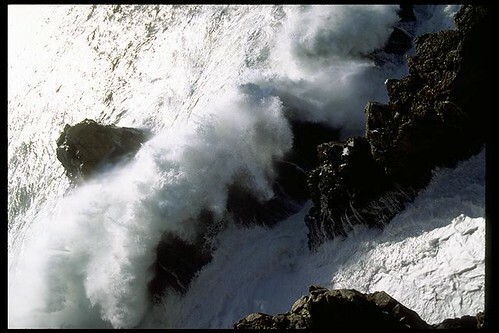 Related to balance, but especially important for documentation photography, is providing a sense of scale in the image. This usually involves including some familiar artifact, such as a chair, path, building, or other "hardscape" element in the image. People are also good for providing scale! 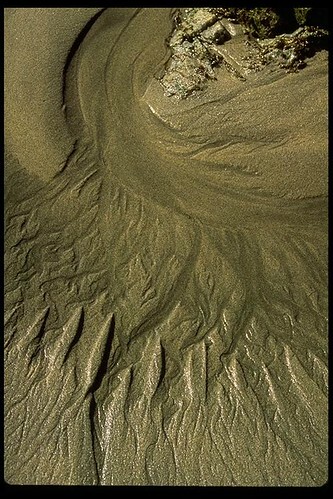 On the beauty side, some of my best photography plays with and disguises or distorts the sense of scale. Macro-photography is one of my favorites for this. Seeing things close-up, the views we usually never stop to see, allows us to see things in a new way, to see details we would never notice. There is so much beauty in the world which we miss because it is too big or small (or we are too small or big) to see it all at once. Of utmost importance for me, which is why I shot slide film. Related to this, the best color is achieved by slightly under-exposing the image, by 1/3 or 1/2 stop. This leaves the colors more "saturated" and less washed out, making the image more vivid and natural looking. Subtleties of color and variation in color are themselves often subjects of my photography. My favorite photographs are able to capture the quality of light which was present when I took the photo. This is a big challenge, but awareness of light - its color, its direction, its qualities - is important to consider when taking the shot. Overcast days are the best for garden photography. With reduced contrast between light and dark, not only can colors be more saturated, but texture and structure don't get lost in the shadows or washed out in sun. 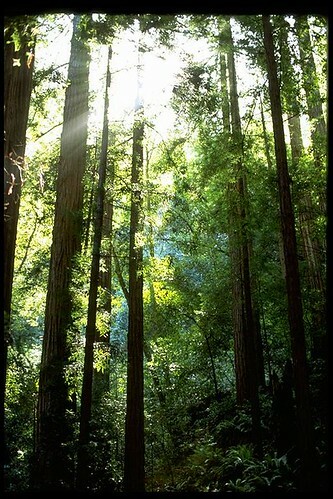 Think of light streaming through the leaves and trunks of trees, or the crepuscular rays of sunlight between clouds. Light becomes visible in these ways when it's scattered by moisture or particles in the air. In other words, the light is making the space visible, giving a three-dimensional quality to the image, and providing the viewer with a palpable sense of the place in which the photo was taken. Everything is changing all the time. 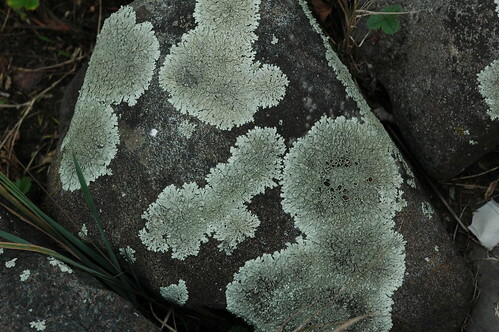 In the garden, some of these changes are obvious, but mostly they are visible only over time. Capturing the different stages of growth of plants and their parts is, again, a way of helping us see the things we would otherwise overlook. The fronds of a fern just emerging from the ground are incredibly detailed, but we rarely see or observe them then. A bud before it opens, or the dried husks of plants in winter, these are things which are also part of the garden, and also beautiful. They are reminders of how fleeting it all is. How temporary and ephemeral is each moment in the garden, as are we. turning Boston’s “Big Dig” waste into spectacular residential design. listings to find out when these episodes will air on your PBS station. 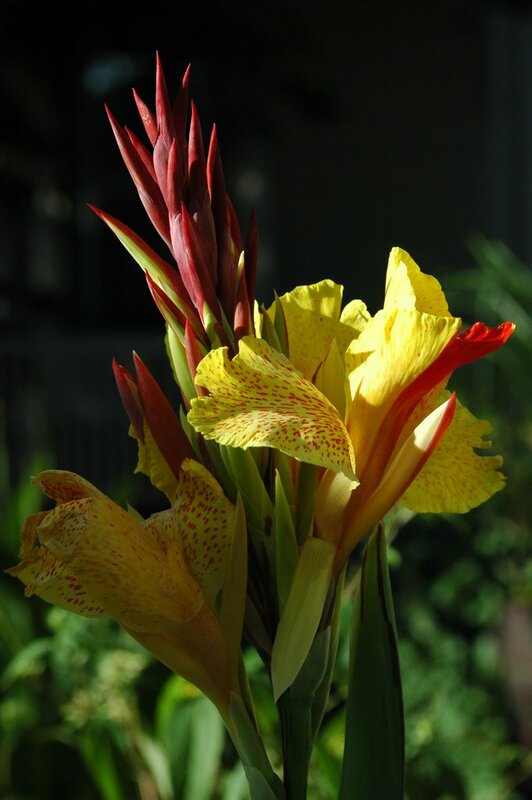 Heirloom Plant Profile: Canna "Cleopatra"
While last week I was obsessed with Amorphophallus titanum at the Brooklyn Botanic Garden, I've also been having my own plant watch here at home. A month ago I blogged about ordering bulbs for next year. 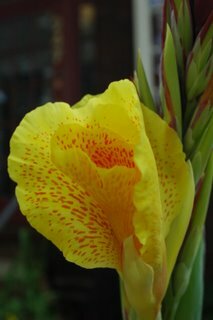 I noted that I had ordered Canna "Cleopatra" from Select Seeds this Spring, but I doubted whether that was what I had received. The leaves are supposed to be variegated green and bronze, but the leaves at that writing still showed only green. Thinking I didn't get what I wanted, I ordered replacement bulbs from Old House Gardens for next Spring. I just needed to be more patient. The sequence of photographs shows how quickly it transformed. I think the heat wave we had really got it going. I planted three bulbs in a large pot in the front yard. 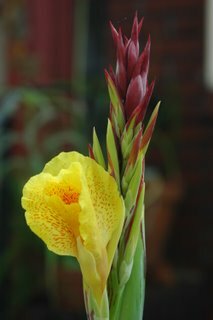 I've now got three flowering stalks. It's attracting comments from all the neighbors. "Cleopatra" was introduced in 1895. 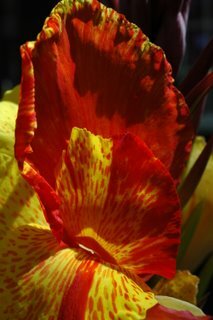 It's also known as the "Harlequin Canna" for its variegated leaves and flowers. The variegation is unstable and unpredictable; you can see from the photos of my plant that the flowers appear different even on the same stalk of blooms. It seems to me it might be a chimera of two different varieties fused together. In other words, it's a freak, and a Victorian freak at that. 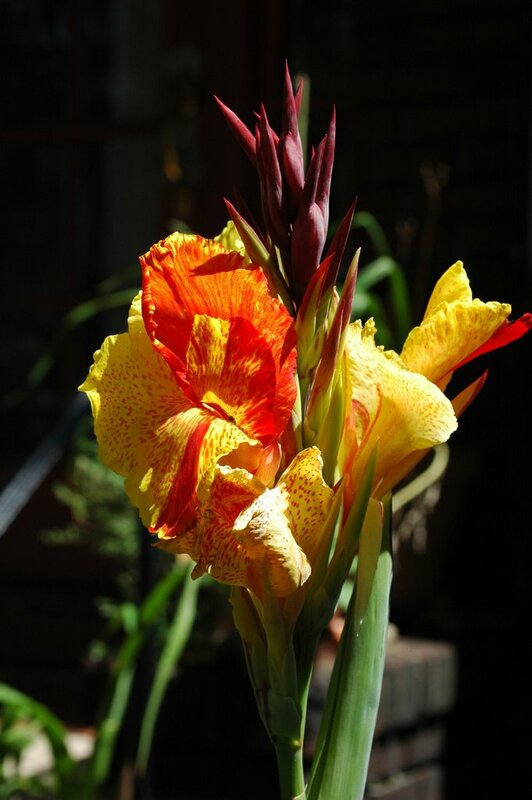 That's why it will always have a place of honor in the heirloom garden at the front of our 105-year old Victorian house. I noticed this critter for the first time earlier this year. I'd never seen it before. The red and black markings are so striking, especially the black heart on the red back, I thought it should be well-known and easily identifiable. I took some earlier, bad photos, but lucked out with these. Still not as crisp as I would like. It was difficult to photograph, since I had to get so close with the lens and it kept moving around. 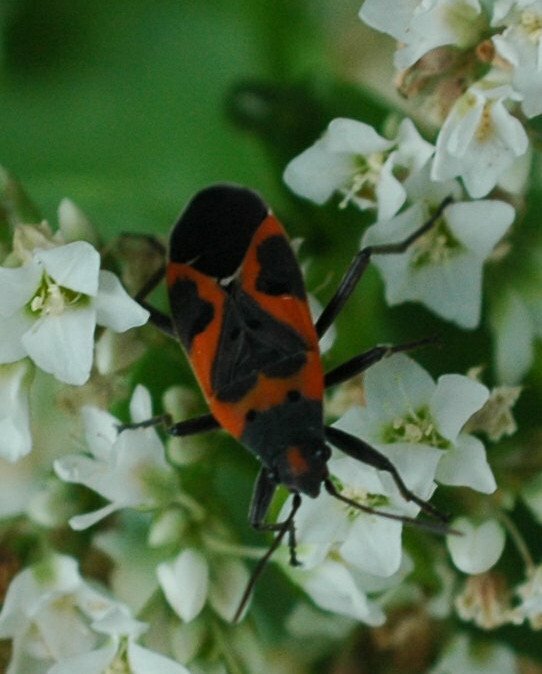 Guessing that it was in the Order Hemiptera, the "true bugs", I found some matching photos on Bug Guide, which identified it as Lygaeus kalmii, Small Milkweed Bug. 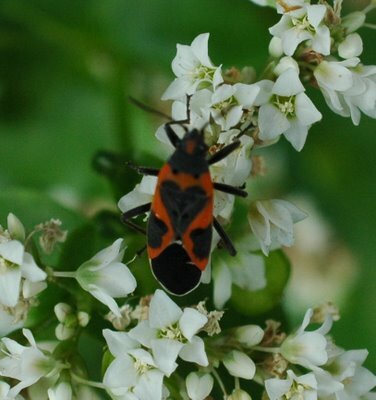 L. kalmii is in the Lygaeidae Family, the seed bugs. Milkweed bugs eat, incredibly, milkweed seeds. I've said the flowers above are "unidentified," since I simply scattered some extra seed in that spot in the garden this spring and didn't label it. But now that I think of it, I did have seed of some Ascelpias species, so this is probably one of them. Insects helping me identify what I planted in the garden ... I like that. 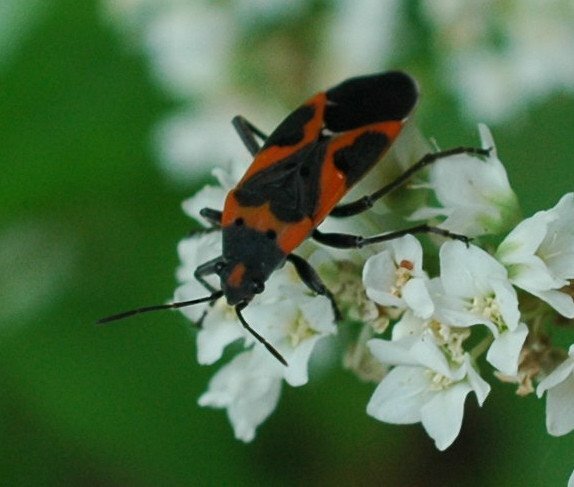 The black and red-orange coloration is shared among many species which feed on milkweed, including Monarch butterflies. It's a warning to predators, such as birds, that they taste bad, from concentrating bitter compounds from the milkweeds in their bodies. I doubt anyone's been waiting breathlessly by their RSS or Atom feeds for my report. Last night, I had to crash early, and today was a picture-perfect day, so I got some gardening work done outside. Nevertheless, I apologize for my tardiness. In the meantime, I hope you've checked out the photos I took yesterday (technically, two calendar days ago, as it's already past midnight Saturday night). I'll highlight some of them here. When I blogged Thursday night, after following the dramatic changes in the bloom on BBG's Web Cam, I had hoped I would be able to get there as soon as they opened at 8am, on my way in to work. That didn't work out, but I did get there Friday afternoon and spent over an hour there. 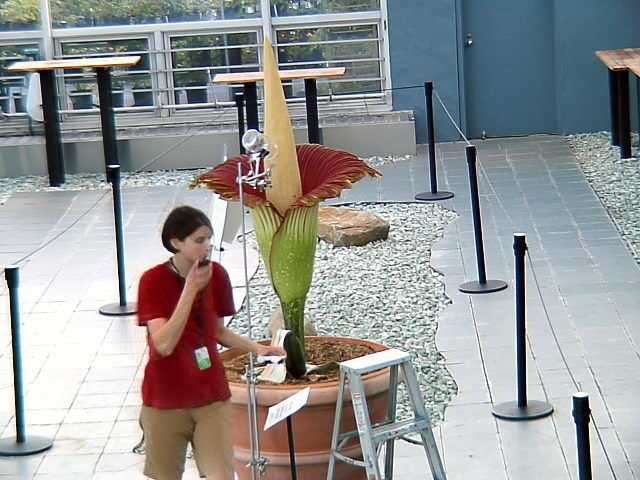 Not only admiring the plant, but taking in the contact adrenaline of BBG staff and visitors. I also got to speak with both Alessandro Chiari and Mark Fisher, and I share my notes from those conversations here. Unless otherwise credited, the pictures in this blog entry are from that visit, and are also available in the flickr set I created from them. I made it back to the Garden by 4:30 a.m., changed, and walk through the Steinhardt Conservatory toward Baby's room—the bonsai museum. The entire conservatory smelled very, very funny! I entered the museum. The aroma could only be described as putrid. I spoke to Susan Pell, one of BBG's botanists, who had camped there all night. She told me that the plant had started stinking at around 8 p.m. (Thursday) and gotten worse ever since. 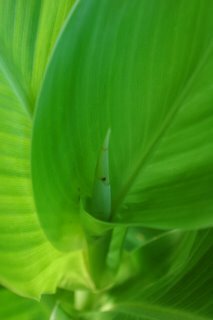 As the morning wore on, I became more and more comfortable around the plant, and it occurred to me that the arum had already entered its declining phase, when it slowly reduces its emissions till it stops smelling. I was right. 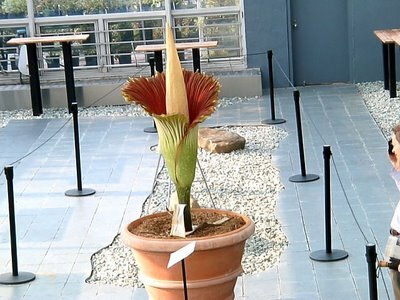 By the time we opened the door to BBG visitors (8 a.m.), there was very little smell left. So, had I gotten there first thing Friday morning, I still would not have had the full experience of the plant, and might not have smelt anything. Mark Fisher described the smell as "like a dead rat" and said that peak scent occurred about 4am Friday morning. Only BBG staff had the privilege of experiencing this. When I visited Friday afternoon, some claimed to still be catching whiffs of it, but I did not. Chiari told me that he observed the spadix sweating - beads of fluid on the structure - at 5am. He also describes this in his blog entry. 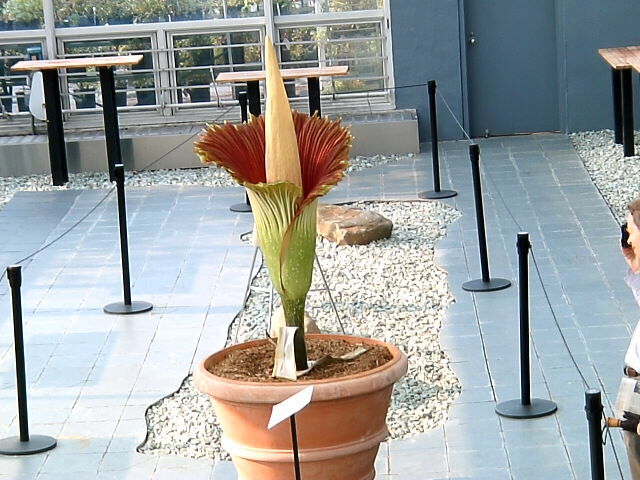 The spadix is the source of the aroma. I speculated on this blog Thursday evening that equipment set up at the bloom, which I saw on the Web cam, was for temperature monitoring. Chairi said they considered it, but it would have required invasive probes and they didn't want to jeopardize the bloom. He explained that the equipment I saw was actually collecting samples of the aroma from the air around the bloom. Knowing what I know now, this makes more sense, since the equipment was "aimed" at the spadix, and not the interior of the spathe. 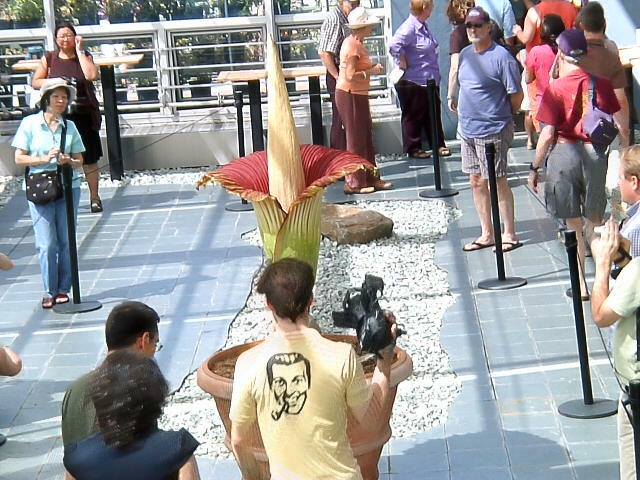 BBG's Titan Arum Web Cam, sampled at 06:35 EDT on August 11, 2006. Chiari pollinated the female flowers at 12:30pm on Friday, August 11. The timing of the pollination was surprising to me. I had thought that the smell was timed to the receptiveness of the female flowers. Apparrently, they remain receptive for at least several hours after the scent has started to fade. Chiari also told me that they would be collecting pollen from the male flowers on Saturday. BBG got their pollen from Virgina Tech, which had just had a bloom the previous week. BBG's pollen will be made available to the next bloom's caretakers. 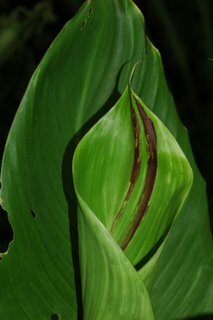 When I visited on Friday afternoon, the rim of the spathe had darkened, and even withered slightly, in some spots. The texture of the spadix had also changed from my visit Wednesday evening, before the spathe had unfurled, and was not as "turgid" as it had been. Nothing widespread, with the male flowers bloom still ahead, but the first signs of decline. Detail of the rim of the spathe, showing the first signs of decline. Be sure to look at the large version of this, and see if you can find the fly on the rim! 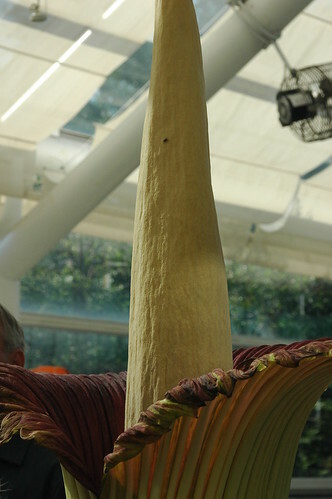 Detail of spadix and most of the rim of the spathe. A fly (the same one as before, I think) is clearly visible on the spadix. 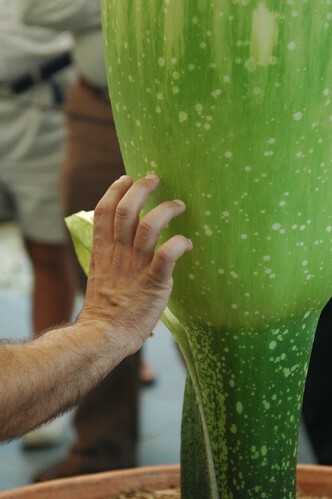 Compare the texture of the spadix in this picture with the photos I took on August 9, two days before. Botanical architecture, a detail view of the underside of the spathe, shot from below. Finally, for those of you who are unfamiliar with the Brooklyn Botanic Garden, some establishing shots to provide context for where all this was going on. 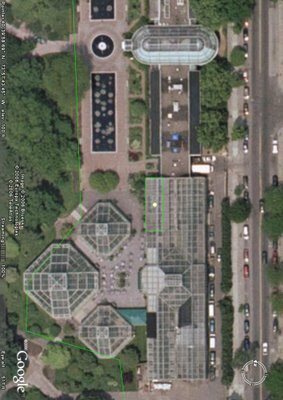 Google Earth satellite photo of the Brooklyn Botanic Garden. North is at the top of the picture. 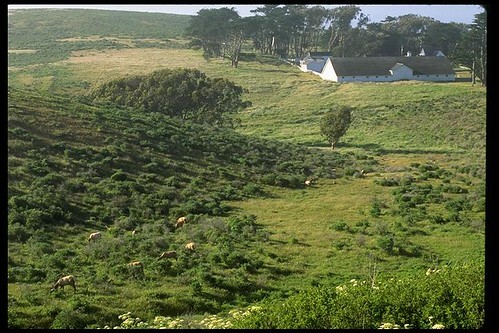 The greenhouses are in the middle right of the photo. Other landmarks: The Brooklyn Museum is the large building at the top of the picture. Prospect Park Zoo is in the middle of the photo, across Flatbush Avenue from BBG. At the bottom of the picture, between Ocean Avenue and Flatbush Avenue, the red-roofed structure is the Prospect Park subway station, the stop I take to get to BBG by subway. 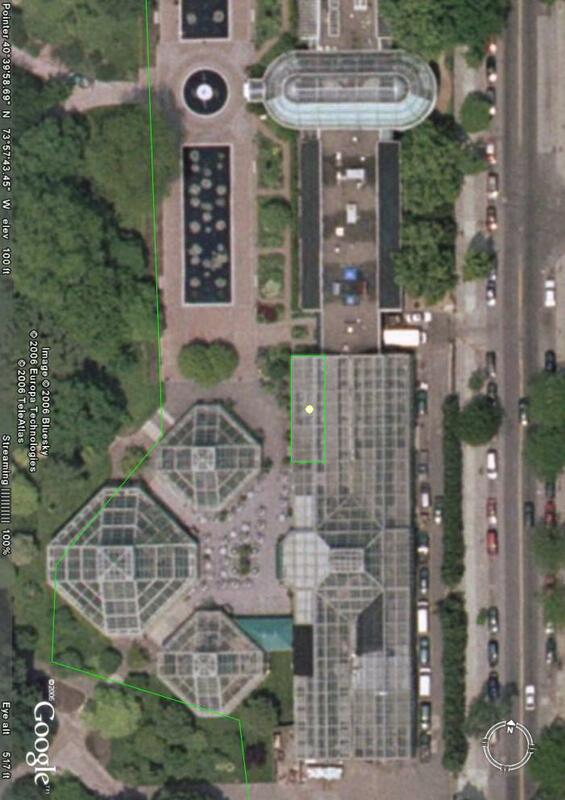 Google Earth satellite photo of the BBG greenhouses and Lily Pool Terrace. The oval glass house at the top of the picture is the Palm Court, used for formal events such as receptions, ceremonies, fundraisers and so on. Below that is the gift shop and offices. I've outlined the Bonsai House in green, and the yellow-white dot shows where "Baby" has been located. 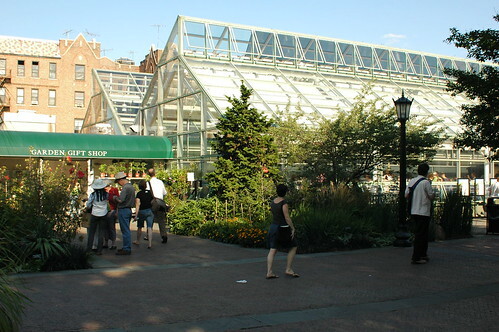 This and all the other structures in the lower part of the photo comprise the Steinhardt Conservatory. The large greenhouses on the lower right are the aquatic and other greenhouses. 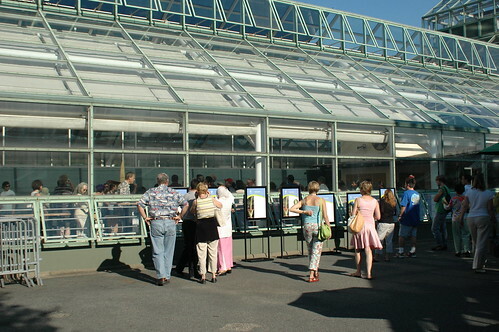 The three octagonal greenhouses are, top to bottom, the warm temperate, tropical, and desert pavilions. Photo taken from the Lily Pool Terrace, showing the entrance to the Gift Shop, and the Bonsai House. Look at the break in the foliage just to the left of the lamp post. You can see the spadix of A. titanum in the Bonsai House. Inside the Bonsai House, with "Baby" and visitors. 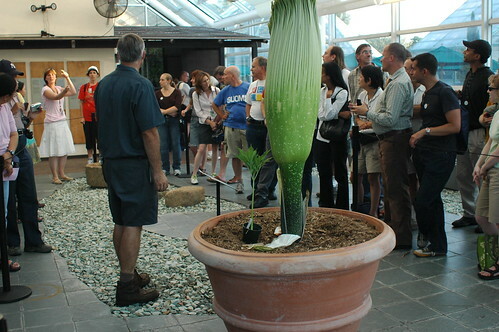 This gives you a good sense of scale for the bloom: it's over 65" tall, not including the pot!. View from the other end of the hall, looking back toward the entrance. You can see the Web Cam high on the opposite wall. Well, campers, it's now past 2:30am. It's taken me two hours to put all this together for you. If you've read this far, I know you've gotten something out of it! Please leave comments with any questions I haven't answered, or even just to let me know what you liked about all this. It's been an exciting time. I look forward to the next time when plants and their admiring geeks make news in the larger world, and we can all feel appreciated for our obsessions, at least for a few days. August 9, 2006: Field Trip Notes, 1 of 3 and What's in a name? I'll be coming back later this evening and filling in my notes from this afternoon's visit, but meanwhile please enjoy some of my photos on flickr. 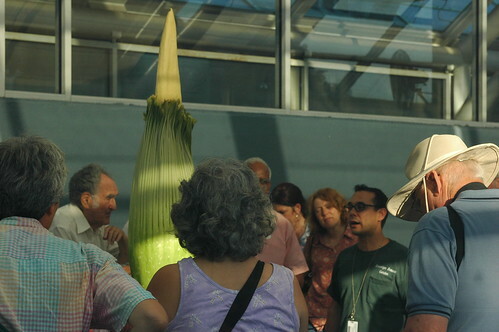 Excitement mounts for BBG's Titan arum, or "Baby got back!" "Baby" as s/he appeared on BBG's Titan Web Cam at 14:44 EDT, August 11, 2006, surrounded by her/his adoring fans. The changes over the past two days have been dramatic indeed. 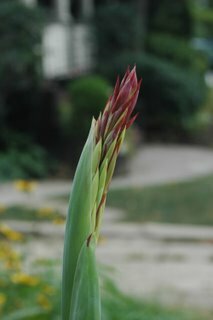 Baby gets closer and closer to peak bloom. The excitement is also peaking. There are many more visitors than there were on Wednesday, probably largely because of all the publicity in the press yesterday. Also, BBG's Web site is straining under the load of visits. There have been many times today I've been unable to get the Titan pages, especially the Web cam page, to load. The link from the title above will take you to BBG's Titan home page. If that fails, try their regular home page at bbg.org and link from there. I didn't get there this morning. I'll be stopping there on the way home from work today, between the hours of 4-6pm. From the smiling faces in the greenhouse, I don't think the smell has started yet. Field Trip, August 9, 2006, #3 of 3: A. titanum at BBG, "Baby's grown up." 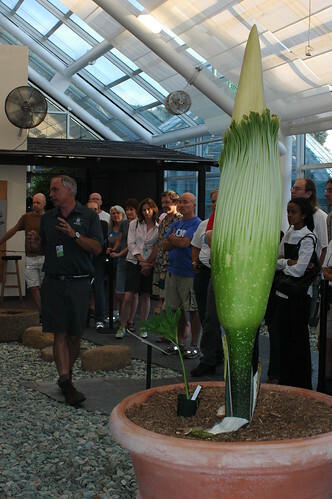 Mark Fisher, foreman of the Steinhardt Conservatory and curator of the Tropical Pavilion at BBG, describes A. titanum's life cycle and growth patterns and the history of BBG's specimen. A. titanum spends many years cycling between growth and dormancy before blooming. 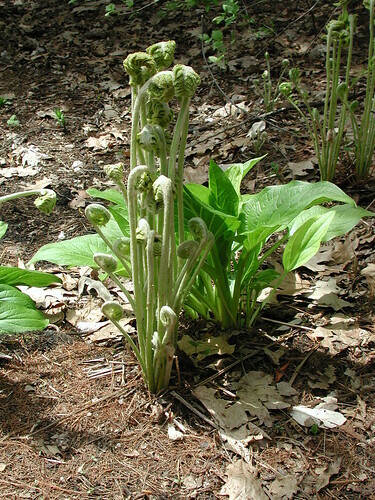 With each cycle of growth, the plant sends up a single shoot. Most of these are vegetative, not reproductive, sending up a single compound leaf on a long stalk. 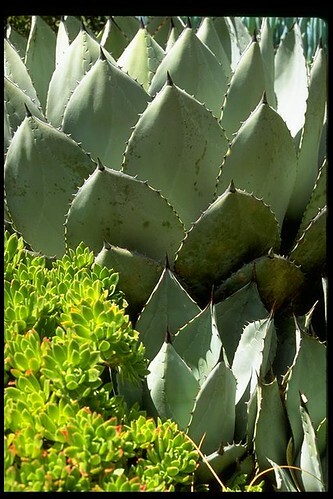 In the photos above, you can see a small specimen of A. titanum which gives you an indication of the shape and proportions of the leaf. The leaf stores energy in the underground tuber, which gets larger with each cycle. 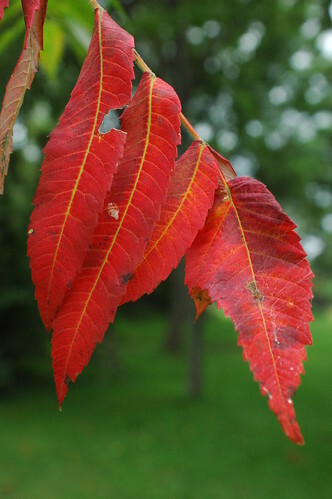 If the leaf is damaged before completing its cycle, the plant can die. This almost happened to BBG's specimen, "Baby", over the past year. Baby is ten years old. Last fall, it sent up a giant single leaf which grew to, if my notes from Fisher's lecture are correct, 18' high by 8' across. The tuber leapt in size, and began to push out the sides of its container. Early this year, the plant, no longer adequately supported by its now rounded container, toppled over, breaking the stem of the leaf. The greenhouse crews splinted the leaf with two-by-fours (and you thought staking tomatoes was challenging! ), saving the leaf, and the plant. When the plant again went dormant this year, they weighed the tuber at 40 pounds. 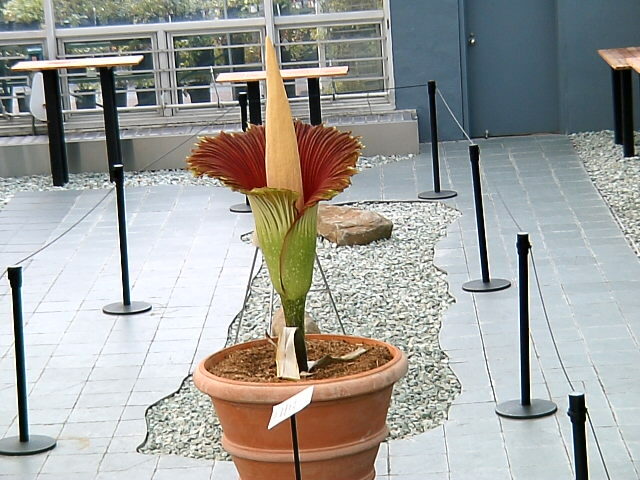 This is still a baby for A. titanum, whose tubers can grow to 200 pounds at maturity. For this reason, when it broke dormancy in June, they expected another single leaf to emerge. Instead, when the first hint of spadix showed, they knew they had a bloom instead of just a leaf. Due to the limited space in the Bonsai House to view the plant, three lecture sessions were scheduled, 20 minutes apart, limited to 50 people each. Twenty minutes was not enough time for all the questions I had, let alone those of other guests. At the end of the second session, I did manage to ask Fisher if they were also going to monitor the temperature of the bloom. 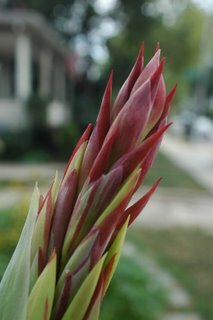 Since many aroids increase their temperature, I wondered if this plant did as well. Mark said that he heard they were going to do that. From the photos below, it looks like they are. 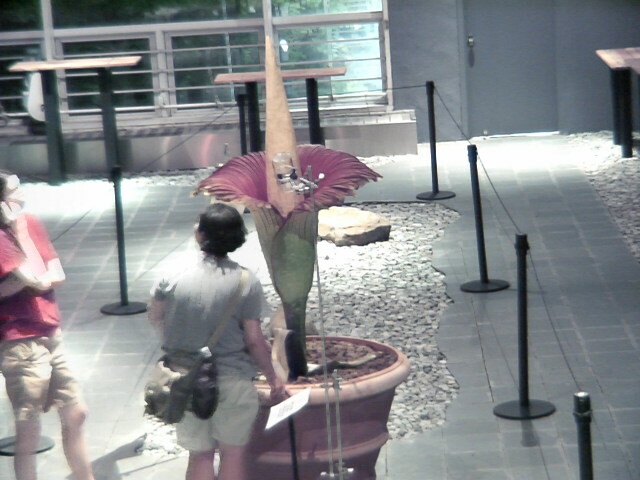 BBG's Titan Arum Web Cam, sampled at 22:25 EDT on August 10, 2006. There were technical difficulties with the lecture sessions. There was not enough time, for sure. They also didn't speak to all their audience. This was theater in the round, after all; it's important to use the entire "stage" and to spend some time facing each section of the audience. Related to this was the lack of amplification. An empty greenhouse doesn't have the best acoustics even under the most favorable circumstances. During my visit, the ventilation machinery of the greenhouse kicked in, with clanks and clangs which I would have found musical had I not already been straining to hear the words of a speaker ten feet off facing away from me. Most things BBG, and especially Chiari and Fisher, did well. They compressed a lot of information into very limited time. I was already familiar with most of what they were sharing with us, so I wasn't worried about not catching all of it. But it also provided an opportunity to talk about the importance of habitat conservation, the impacts of plant predation by unscrupulous collectors, and the tenuous grip on survival that many species already have without our help to push them over the brink. 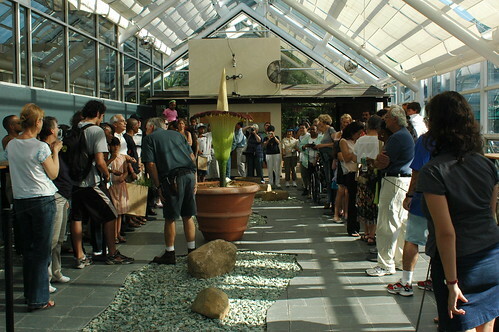 Most of all, they shared their wonder, their joy, their plant geek natures with us. And I, fellow geek, felt at home. 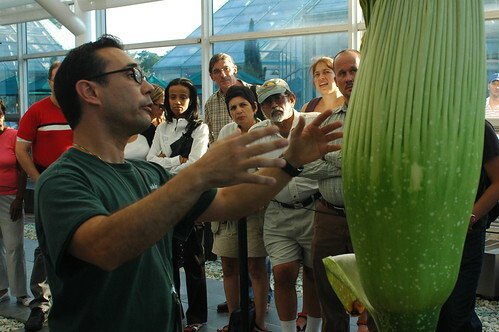 Field Trip, August 9, 2006, #2 of 3: A. titanum at BBG, "Morphology, longevity, incept dates ..."
Dr. Alessandro Chiari, Plant Propagator at BBG, explaining A. titanum bloom morphology, behavior, and ecology. 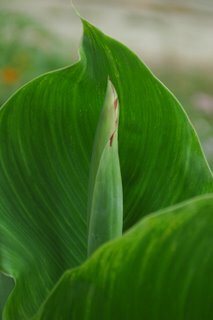 The spathe, the outer sheath of the bloom, will continue to pull away from the spadix, widening and deepening in color as it does. When fully open, it will be a few feet in diameter. 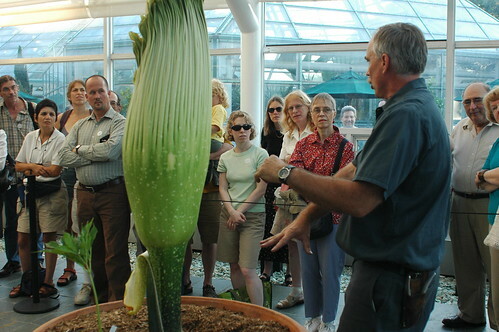 As the spathe opens, the female flowers, in a band at the very bottom of the spadix, will begin to bloom and become receptive to pollination. 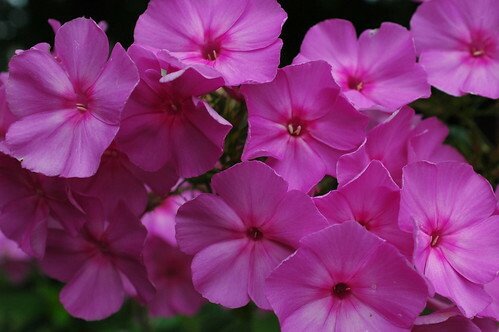 It's at this time only that the bloom becomes "fragrant." The fragrance attracts pollinators, in this case: carrion beetles and sweat bees, which are attracted to the scent of rotting flesh in which to lay their eggs. 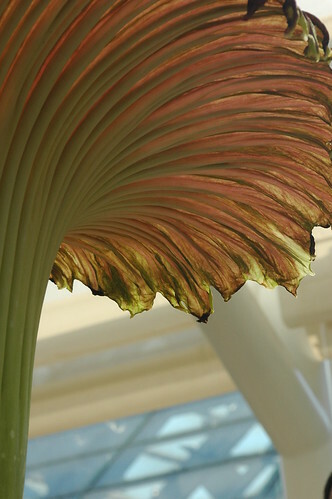 Not finding any rotting flesh, they continue to hang out, depositing any pollen they have brought in from visiting other Titan arums. Having been pollinated, the female flowers begin to wither. 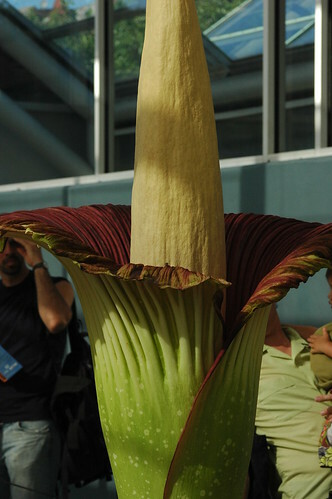 The male flowers, in a band just above the female flowers on the spadix, become fertile and begin to express pollen. The scent dies. 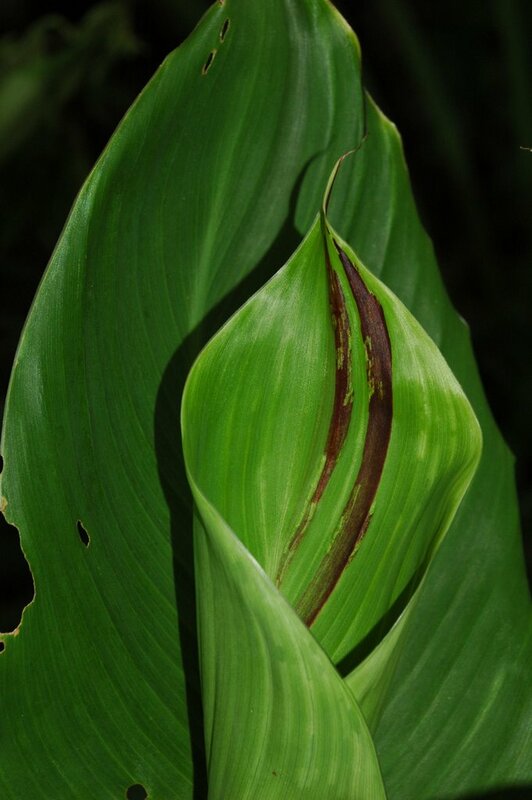 The beetles and bees, with nothing to keep them there, begin to leave the base of the spadix. 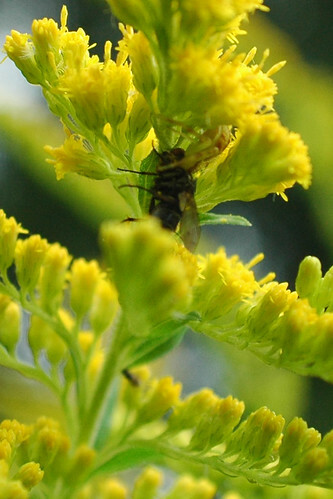 As they do, they pick up fresh pollen from the male flowers on their way up the spadix and out of the spathe. After that, the spadix and spathe collapse and the plant, hopefully, sets seed. This precisely timed choreography enforces cross-pollination between different plants. 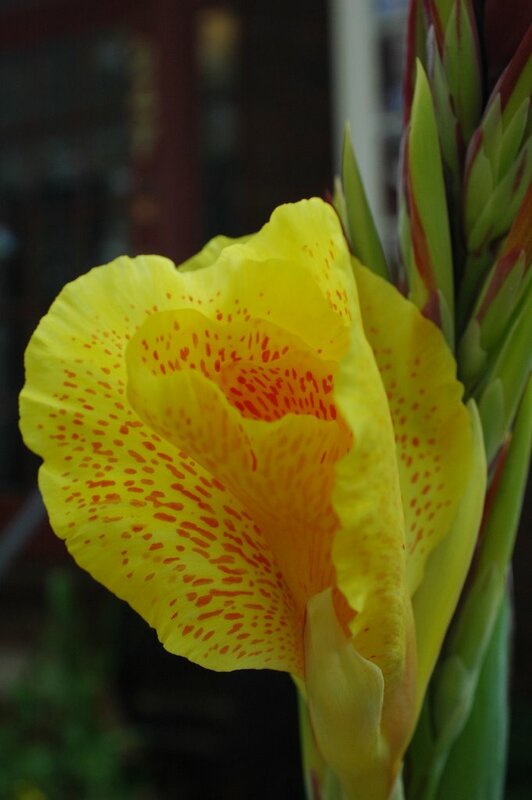 Since the female flowers bloom before the male flowers, not even trace amounts of pollen from the same plant will be around to fertilize the female flowers. 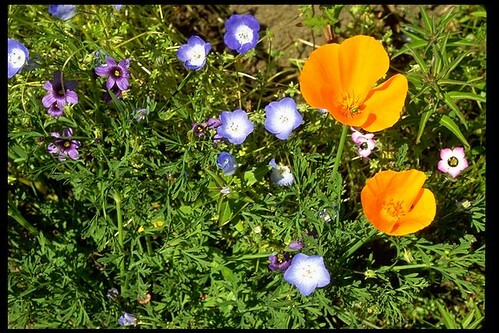 It does require available pollinators and enough blooming plants within flying distance of each other. Even in the wild, this is not a certainty by any means. Habitat destruction and collection of the plant have reduced its numbers and the possibility that two plants will bloom close enough in time and space for successful pollination. In cultivation, when the most recent bloom was weeks or months before and thousands of miles away, the propagators must step in. BBG received pollen from Virgina Tech on August 8. When the female flowers are ripe, Alessandro Chiari, BBG's Plant Propagator, will step in to pollinate them. BBG hopes to collect the seed from their plant and propagate more of it. 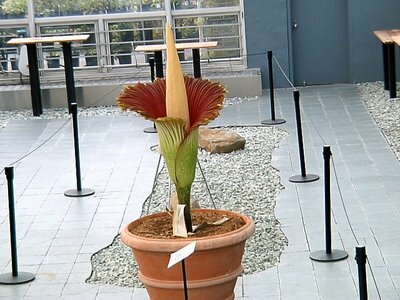 Earlier today: Happy Corpse Flower Day! August 9, 2006: What's in a name? 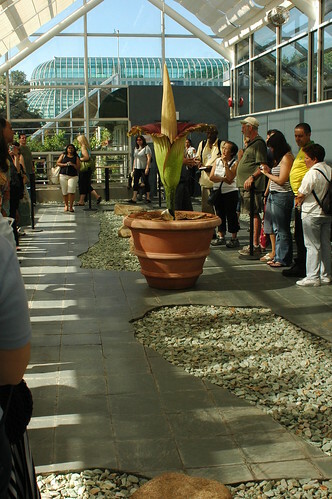 Update: BBG's Titan Arum peak bloom is imminent, or "Happy Corpse Flower Day!" BBG's Titan Arum as it appeared on their Web cam at 17:34 EDT, August 10, 2006. BBG's Titan Arum as it appeared on their Web cam at 18:56 EDT, August 10, 2006. There's been a dramatic change in the appearance of the flower since I was there just last night. 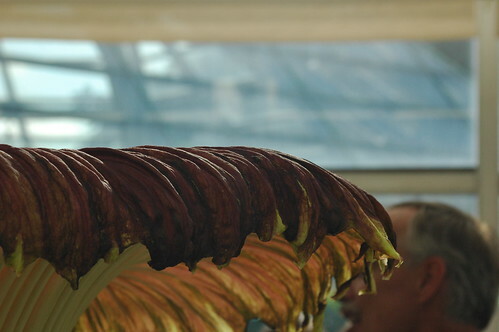 The upper rim of the spathe has pulled completely away from the spadix. The rich red interior of the spathe is now clearly visible all around the bloom. Not that I have any experience with such things, but from looking at the photographic sequences of other blooms from around the world, it looks like it will reach peak bloom tomorrow. I'm going to continue monitoring on their Web cam to see if I can get there when it's at its peak. I hope I can make it. "The name's Phallus ... Amorpho-phallus ..."